We continue our series on NASBA’s committees with a look at the Nominating Committee. The Nominating Committee’s charge is to nominate officers and directors, in accordance with NASBA’s Bylaws. Nominating Committee members are elected for two-year terms, and may serve two complete terms in succession, plus any unexpired terms. The term begins immediately following the Business Session of NASBA’s Annual Meeting. The terms of the Nominating Committee members are staggered so that only one-half of the eight regions hold elections each year. Membership in the Committee consists of the Past Chair and one member from each NASBA region elected by its member boards. The Committee meets twice each year in person to nominate one qualified candidate for Vice Chair, three candidates for Directors-at-Large for those whose terms are expiring at NASBA’s Annual Meeting, and one candidate for Regional Director from each region. If the Vice Chair cannot serve as Chair, then the Committee also shall nominate a candidate for Chair. 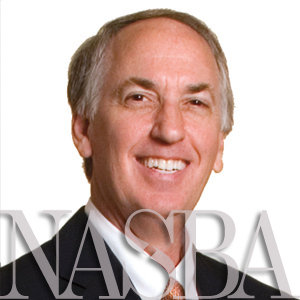 Ken Bishop, President & CEO of NASBA, said the Nominating Committee is critical because NASBA relies on the elected members of the Nominating Committee and their hard work and diligence to identify and select volunteer leadership. He also said that this year, the Nominating Committee has reviewed and updated how it communicates the selection criteria and process to improve the awareness to Boards of Accountancy. “By clearly promoting the requirements and significance of the selection and nomination process, we hope to increase volunteer interest in serving in a leadership capacity,” said Bishop. This year, the Committee met March 18 to select Walter C. Davenport as the nominee for Vice Chair in 2013-2014. Once confirmed by the membership at the Annual Meeting, the Vice Chair will automatically accede to Chair the following year. Former NASBA Chairs Billy Atkinson and Diane Rubin were selected in September 2012 by the Financial Accounting Foundation’s Board of Trustees to serve on the Private Company Council (PCC) that works with the Financial Accounting Standards Board to determine whether and when to modify U.S. Generally Accepted Accounting Principles for private companies. Atkinson was named PCC Chair. In April 2013, former NASBA Chair and Iowa Auditor of State, David A. Vaudt, was named the next chairman of the Governmental Accounting Standards Board (GASB). Currently the CPA Examination Review Board vice chair, Vaudt will begin serving a single, seven-year term effective July 1, 2013, upon the retirement of current GASB Chairman Robert H. Attamore. To see a list of participating Nominating Committee members, please visit the Nominating Committee page in the Committees section of this website.